Friederich "Fred" KREISCHER was born on 10 Feb 1865	in Harrison Twp, Van Wert, Ohio. Friederich was married to Emma SCHAADT on 2 Dec 1886 in Van Wert County, Ohio. 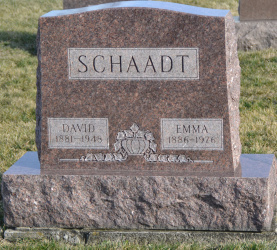 Emma SCHAADT, daughter of Jacob SCHAADT, was born on 5 Nov 1865 in Harrison Twp, Van Wert, Ohio. Emma died on 1 Jan 1893 at the age of 27. 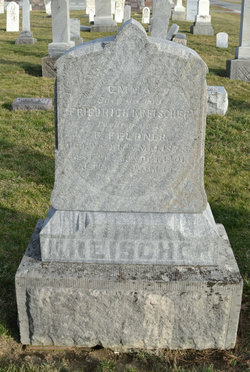 Emma was buried at Evangelical Protestant Cemetery in Convoy, Van Wert, Ohio. 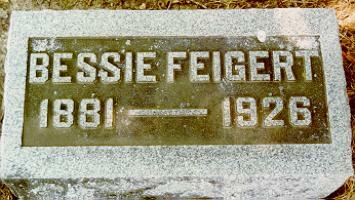 Friederich "Fred" KREISCHER and Emma FELDNER were married on 12 Nov 1893 in Van Wert County, Ohio. Emma FELDNER, daughter of P. FELDNER, was born on 24 May 1873. Emma died on 23 Oct 1901. She died while cooking apple butter. 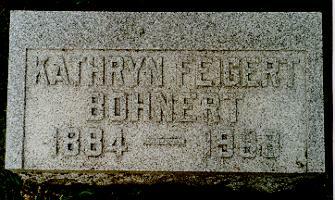 She was buried in 1901 in row 5 of the Evangelical Protestant Cemetery in	Convoy, Van Wert, Ohio. ii. 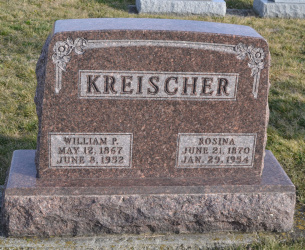 Norman Friedrich KREISCHER Sr.
Friederich "Fred" KREISCHER and Margaret MAUER were married on 24 Apr 1913 in Tuscarawas, Tuscarawas, Ohio. Margaret MAUER, daughter of John SENER or Peter Scaer and Catharine EMRICH, was born on 11 Apr 1868 in Indiana. 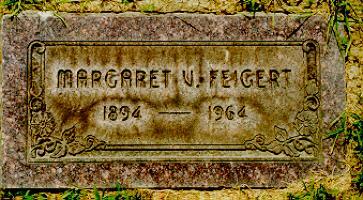 Margaret died from cancer of the kidneys on 1 Nov 1917 at the age of 49 in Tully, Van Wert, Ohio. She was buried on 4 Nov 1917 at Evangelical Cemetery in Convoy, Van Wert, Ohio. 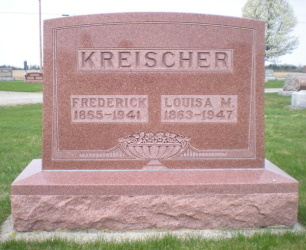 Friederich "Fred" KREISCHER and Louisa MOSEL were married on 4 Aug 1918 in Van Wert County, Ohio. Louise MOSEL, daughter of Philip BEARD and Mary Elizabeth REIDENBACH, was born on 26 May 1863 in Harrison, Van Wert, Ohio. Friederich died on 12 Dec 1941 at the age of 76 in Van Wert, Van Wert, Ohio. Friederich was buried on 14 Dec 1941 at Convoy I.O.O.F Cemetery in Convoy, Van Wert, Ohio. Louisa died of a cerebral thrombosis due to general arteriosclerosis and senilty on 15 Apr 1947 at the age of 83 at	South Main Street in Convoy, Van Wert, Ohio. She was buried on 17 Apr 1947 at Convoy I.O.O.F Cemetery in Convoy,	Van Wert, Ohio. William Peter KREISCHER was born on 12 May 1867 in Harrison, Van Wert, Ohio. William was married to Rosina GEHRES on 5 Nov 1891 in Van Wert County, Ohio. Rosina GEHRES, daughter of Phillip GEHRES and Elizabeth GIESSLER, was born in Jun 1870 in Ohio. The family appeared on the census on 5 Jan 1920 in Van Wert, Van Wert, Ohio (ED122, Vol 205, Sheet 8, Line 62-66). William died on 8 Jun 1952 in Van Wert, Van Wert, Ohio. He was buried on 11 Jun 1952 at Evangelical Protestant Cemetery in Convoy, Van Wert, Ohio. In his children's baptisms, he was listed as Wilhelm Kreischer. Rosina died on 29 Jan 1954 in Van Wert, Van Wert, Ohio. She was buried in Evangelical Protestant Cemetery in Convoy, Van Wert, Ohio. Josephine KREISCHER was born in 2 Nov 1869 in Harrison Twp, Van Wert, Ohio. 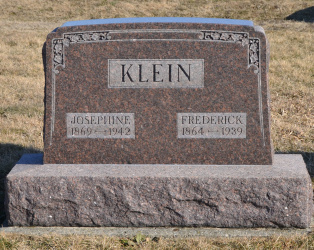 Josephine was married to Frederick "Fred" KLEIN on 13 Sep 1887 in Van Wert County, Ohio. Frederick C. "Fred" KLEIN, son of Peter KLEIN and Phillippina Phoeba SCHAADT, was born on 1 Jul 1864 in Harrison Twp, Van Wert, Ohio. Frederick died on 29 Nov 1939 at the age of 75 in Convoy, Van Wert, Ohio. He was buried on 1 Dec 1939 at St. John's Cemetery in Van Wert County, Ohio. Josephine died on 2 Apr 1942 at the age of 72 in Convoy, Van Wert, Ohio. She was buried on 5 Apr 1942 at Saint Johns Cemetery in Van Wert County, Ohio. Louisa-1 KREISCHER was born on 14 Sep 1872 in Harrison, Van Wert, Ohio. 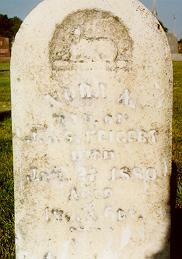 She died on 2 Dec 1872 at the age of 0 in Harrison, Van Wert, Ohio. Louis KREISCHER was born on 4 Jul 1874 in Harrison, Van Wert, Ohio. Louis died on 8 Jan 1875 in Harrison, Van Wert, Ohio. Louise KREISCHER was born on 5 Nov 1875 in Convoy, Van Wert, Ohio. 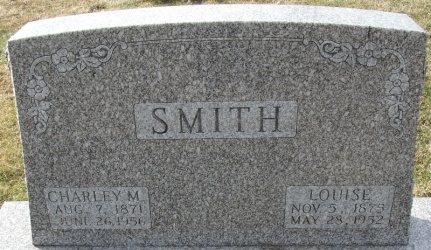 Louise was married to Charles M. "Charley" SMITH on 9 Mar 1900 in Van Wert County, Ohio. They were married by Reverend J. A. West of Convoy, Ohio. Charles M. SMITH, son of James SMITH and Elizabeth REED, was born on 7 Aug 1871 in Harrison Twp, Van Wert, Ohio. Louise died on 28 May 1952 at the age of 76 in Cincinnati, Hamilton, Ohio. She was a dressmaker. 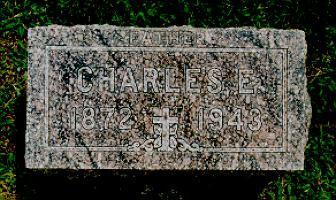 Charles died on 6 Jun 1956 at the age of 84 in Van Wert, Van Wert, Ohio. He was buried on 29 Jun 1956 in Van Wert County, Ohio. He was a funeral director and a farmer. 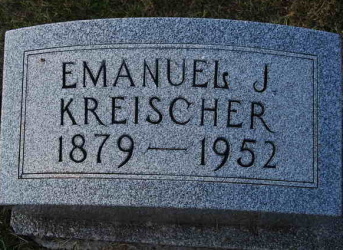 Emanuel John KREISCHER was born on 7 Jun 1879 in Tully Twp, Van Wert, Ohio. John was married to Pearl DRESSEL on 16 Sep 1903 in Van Wert County, Ohio. They were married by Reverend S. A. Zimbeck. 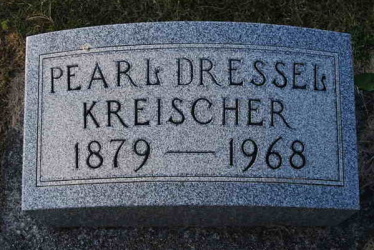 Pearl DRESSEL, daughter of Jacob DRESSEL and Erma MILLER, was born on 19 Feb 1879 in Tully Twp, Ohio. 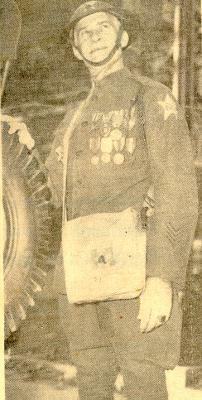 Emanuel died on 22 Dec 1952 at the age of 73 in Convoy, Van Wert, Ohio. He was buried on 24 Dec 1952 at	IOOF Cemetery in Convoy, Van Wert, Ohio. He was a retail merchant and a cigar maker. Pearl died on 15 Mar 1968 at the age of 89 in Bowling Green, Wood, Ohio. She was buried on 18 Mar 1968 at IOOF Cemetery in Convoy, Van Wert, Ohio. Martin KREISCHER was born on 12 Feb 1883 in Harrison, Van Wert, Ohio. He died on 7 Mar 1883 at the age of 0 in Harrison, Van Wert, Ohio. Edna Fontaina WEBB was born on 14 Aug 1894 in Ohio City, Cuyahoga, Ohio. 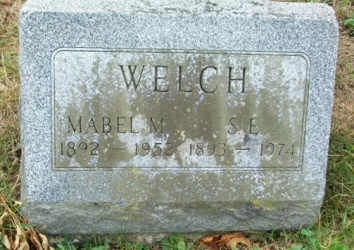 She was married to Shepard Edson WELCH on 3 Jun 1911 in Van Wert County, Ohio. They were married by Reverend Charles H. Gotchell. 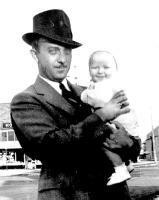 Shepard Edson WELCH, son of George WELCH and Addie R. WHEELER, was born on 23 Feb 1893 in Hoaglin, Van	Wert, Ohio. He was a farmer. Edna divorced Shepard before 1940. 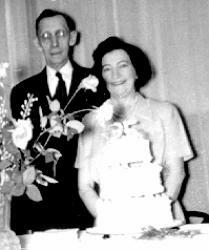 Edna Fontaina WEBB and Alva MCELDOWNEY were married before 1940. Alva MCELDOWNEY was born on 8 Jun 1891 in Mercer County, Ohio. Edna died of severe shock from amputation of the mangled right foot and crushing injuries of chest due to an automobile accident on 10 Dec 1943 at the age of 49 at Marion city Hospital in Marion, Marion, Ohio. Alva died on 14 Jun 1963 at the age of 72 in Marion County, Ohio. Shepard died in 1974 at the age of 81. 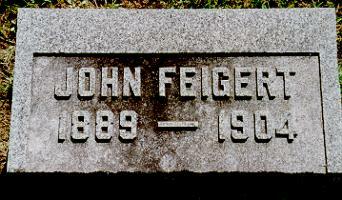 He was buried at Grand Prairie Cemetery in Brush Ridge, Marion, Ohio. 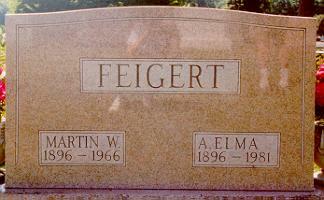 Charles Edward "Edwin" FEIGERT and Rosella E. "Della" KUHLMAN were married on 6 Feb 1894 in Fayette County, Indiana. Rosella E. KUHLMAN, daughter of Henry KUHLMAN and Mary A., was born in Sep 1872 in Indiana. Charles died at Fayette Memorial Hospital on 21 Dec 1943 in Connersville, Fayette, Indiana. The contributory of death is hypertension and the cause of death is cerebral hemorrhage. He was buried on 24 Dec 1943 in Connersville, Fayette, Indiana. He was buried in lot 75A of Dale Cemetery by Miller Funeral Home. For 54 years, he was employed in the blower business in Connersville, starting at the Roots plant when he was 14 to help supplement his parents' income. When he retired, he was superintendent of the machine shop at the Connersville Blower Company. Both plants were merged into Dress Industries later. He was an outstanding baseball player and golfer. In the courthouse of Connersville, a scroll of honor listed Charles as a World War II Veteran along with Marion H. Walker, John R. Feigert, Paul E. Feigert, and Donald G. Walker. Rosella died on 26 Jun 1946. She was buried on 29 Jun 1946 in Connersville, Fayette, Indiana. She was buried in lot 75A of Dale Cemetery by Miller Funeral Home. She was a musician. She was married to William Augustic "Will" WALKER on 30 Jun 1895 in Fayette County, Indiana. William Augustic "Will" WALKER was born on 1 Mar 1869 in Indiana. William died on 29 Jul 1928. 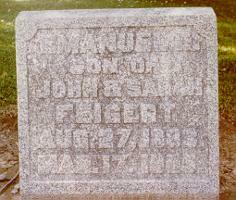 He was buried on 18 Aug 1928 in Connersville, Fayette, Indiana. He was buried in lot 75B of Dale Cemetery by Smith Funeral Home. Helena died on 20 Feb 1952 in Indianapolis, Marion, Indiana. She died at her daughter Helen's home. Florence's diary says March 1952 was the date. 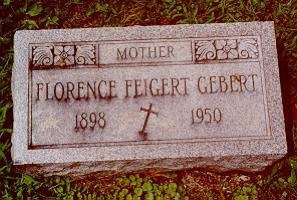 She was buried in Connersville, Fayette, Indiana. She was buried in lot 75B of Dale Cemetery. His name was reported as Otto Fritz Feigert. Frederick was married to Maude Elizabeth MEYER on 18 Jun 1902 in Fayette County, Indiana. Maude Elizabeth MEYER, daughter of Martin B. MEYER and Sussanna L. DONOVAN, was born on 24 Nov 1876 in Connersville, Fayette, Indiana. The family appeared in the census on 10 Jan 1920 in Connersville, Fayette, Indiana. The family were living at 201 Fourth Street. Frederick died on 21 Apr 1941 in Connersville, Fayette, Indiana. He died at home on 201 West 4th Street. The contributory is Coronary Thrombosis and the cause of death is Myocardial Failure. He was buried on 24 Apr 1941 in Connersville, Fayette, Indiana. He was buried in lot 30B of Dale Cemetery by Miller Funeral Home. 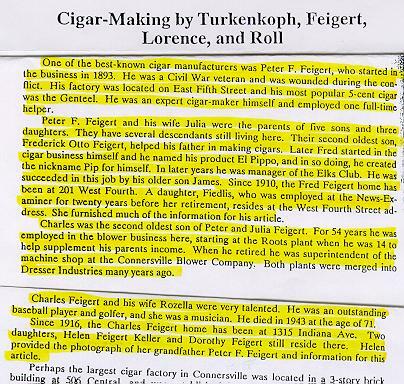 Frederick had helped his father in making cigars. Later he started in the cigar business himself and he named his product El Pippo, and in so doing, he created the nickname Pip for himself. In later years, he was manager of the Elks Club in Connersville. His son James succeeded him in this job. Maude died on 31 Jan 1943. She died at home on 201 West 4th Street. The cause of death is Cerebral Hemorrhage. She was buried on 3 Feb 1943 in Connersville, Fayette, Indiana. She was buried in lot 30B of Dale Cemetery by Miller Funeral Home. 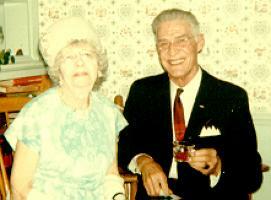 Thomas Edwin "Tom" or "Edward" FEIGERT and Myrtle Belle GARNER were married on 24 Feb 1914 in Detroit, Wayne, Michigan. Myrtle Belle GARNER, daughter of William M. GARNER and Belle FERGUSON, was born on 5 Apr 1879 in Columbus, Franklin, Ohio. Myrtle was a cigar maker. Thomas died in Mar 1935. A story	of Tom leaving for a loaf of bread, returning after 13 years on the run, asking	wheat or white? Katherine Mary	"Kitty" FEIGERT was born on 23 Jul 1883 in Adams County, Indiana. Katherine was married to Clyde MANSIL were married on 21 Nov 1911 in Fayette County, Indiana. Clyde A. MANSIL, son of Thomas MANSIL and Amanda SANDERS, was born on 16 Dec 1884 in Fayette County, Indiana. Clyde died on 28 Sep 1916 in Peru, Miami, Indiana at the age of 31. She was married to Wendolin Phillip "Bon" BOHNERT on 25 Oct 1927 in Indianapolis, Marion, Indiana. Wendolin Phillip "Bon" BOHNERT was born on 7 Feb 1896. Katherine died on 7 Jun 1968 in Indianapolis, Marion, Indiana. She was buried on 10 Jun 1968 in Connersville, Fayette, Indiana. She was buried in lot 75B of Dale Cemetery by Feeney-Kirby Mortuary of Indianapolis, Indiana. Bon died in Nov 1978. He was buried in Dale Cemetery. He died on 19 Mar 1904. See Saint Gabriel's Catholic Church Death Record. 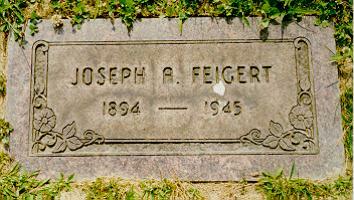 Joseph Austin FEIGERT was born on 21 May 1894 in Huntington, Huntington, Indiana. Austin was married to Margaret VOGELSONG. Margaret VOGELSONG was born on 3 Oct 1894. Austin died at Pittsburgh Hospital on 29 Jul 1945 in Pittsburgh, Allegheny, Pennsylvania. Austin was buried on 1 Aug 1945 in North Versailles, Pennsylvania. The funeral services were held at Daugherty Funeral Home of Trafford, Pennsylvania on Tuesday with burial the next day. He was buried in lot M308 of Grandview Cemetery. He had owned a restaurant named Feigert's Restaurant on 208 Fifth Street of Trafford, Pennsylvania. It was in operation from 1933 to 1947 (for some reason, the owner was listed as James Feigert). There was a Westinghouse factory across the bridge that made turbines. The restaurant would attract the workers from the factory. He had lived at and managed the Greensburg Country Club in Pennsylvania. Margaret died on 20 Oct 1964 in Cape Giauridi, Missouri. She was buried in 1964 in Lot M308 of Grandview Cemetery in North Versailles, Pennsylvania. The birth date was taken from the cemetery records. After the death of Austin, she moved to Cape Giauridi, Missouri. She was baptized on 13 Nov 1898 in Huntington, Huntington, Indiana. She was baptized as Maria Florentia in Saints Peter and Paul Catholic Church of Huntington, Indiana. Godfather was Joannes German and godmother was Maria Anna Nagel. Confirmation name may be Agnes or Myrtle. 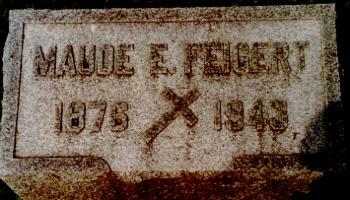 Florence was married to Paul Haas "Butsie" GEBERT on 12 Apr 1925 in Connersville, Fayette, Indiana. They were married at Saint Gabriel Rectory by Monsignor T. S. Mesker. 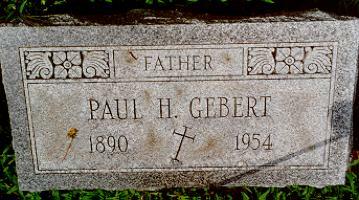 Paul Haas "Butsie" GEBERT (son of George Frederich GEBERT and Margaret "Maggie" HAAS) was born on 2 Dec 1890 in Connersville, Fayette, Indiana. He is a twin brother of Arthur. The attendants were Mrs. Kathryn Mansil of Indianapolis, sister of the bride, and Arthur Gebert of this city, twin brother of the groom. After the wedding a reception was held at the home of the bride�s sister and husband, Mr. and Mrs. W. A. Walker, 2157 Grand avenue, with whom she has lived since the death of her parents, Mr. and Mrs. P. F. Feigert. Born In Huntington, Ind., a daughter of Peter F. and Julia Millenbaugh Feigert, she had lived in Connersville since she was a year old. She was a member of St. Gabriel Catholic Church, St Ann�s Altar Society, St. Gabriel P. T. A. and the American Legion Auxiliary. She also was an auxiliary member of the Legion of Mary at St. Gabriel Church. Rites will be held at 9 a. m Saturday In St. Gabriel Church with burial in Dale Cemetery. Friends may call at the Miller Funeral Home at Seventeenth and Grand, beginning Friday morning. Florence died on 27 Jul 1950 in Connersville, Fayette, Indiana. 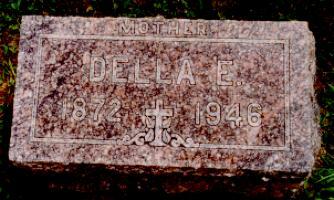 She was buried on 29 Jul 1950 in Connersville, Fayette, Indiana. She was buried in lot 200D of Dale	Cemetery by Miller Funeral Home. Included in the survivors are: a daughter, Miss Julia Gebert, at home; two sons, Thomas Gebert, also at home and John of Connersville; four grandchildren; two sisters, Mrs. A. A. Sandstrom of Indianapolis, and Mrs. H. A. Magnuson of Ft. Wayne. Paul died on 12 Apr 1954 in Connersville, Fayette, Indiana. He died at Fayette Memorial Hospital. 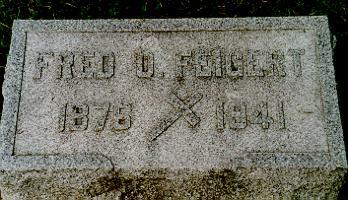 He was buried on 14 Apr 1954 in Connersville, Fayette, Indiana. He was buried in lot 200D of Dale Cemetery by Miller Funeral Home. He may have been Methodist and converted to Catholicism after the death of his wife Florence. His first house with Florence was on Grand Avenue in Connersville. In the courthouse of Connersville, a scroll of honor listed Paul as a World War Veteran (this would have been World War I) along with Donald G. Walker. Paul and his brother Art were runners for Western Union. 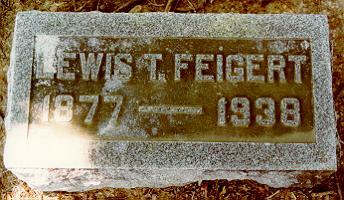 Lewis Thomas "Lou" FEIGERT was born on 10 Mar 1877 in Van Wert County, Ohio. Lewis Thomas "Lou" FEIGERT and Bessie L. LARK were married on 29 Sep 1909 in Allen County, Indiana. Bessie L. LARK, daughter of William B. LARK and Sarah HENCH, was born on 12 Oct 1881 in Port Royal, Juniata , Pennsylvania. A 1910 Census record says Indiana was her birth place. Lewis appeared on the census on 13 Jan 1920 in Pleasant Twp, Van Wert, Ohio. The family was living at 328 Gordon Ave.
Bessie died of cancer in lungs on 28 May 1926 at the	age of 44 in Van Wert, Van Wert, Ohio. The name on the death certificate is Bessie Barker Browning Feigert. She was buried in Van Wert, Van Wert, Ohio in Woodland Union Cemetery. Lewis died on 9 Feb 1938 in Van Wert, Van Wert, Ohio. He was buried on 12 Feb 1938 in Van Wert, Van Wert, Ohio. He was buried in section 67, row 5 of the Woodland Union Cemetery. Is his name Ludwig Thomas as recorded in the church record? She was baptized on 23 Jan 1880. She was baptized in the German Evangelical Protestant Church. Her parents are her godparents. She died on 27 Jan 1880. The church record her cause of death as cramps. The church record said that she was survived by her parents and 1 brother (am assuming that would be Lewis). 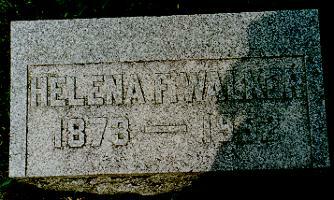 She was buried on 27 Jan 1880 in Convoy, Van Wert, Ohio. She was buried in 11th row, 26th stone from left of Evangelical Protestant Cemetery. She was baptized on 11 Sep 1881. She was baptized in the German Evangelical Protestant Church. Her parents are her godparents. She was married to Oscar A. STETTLER on 10 Sep 1910 in Van Wert, Van Wert, Ohio. They were married by Reverend James A. Gordon. 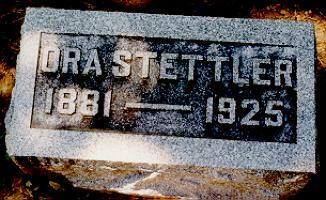 Oscar A. STETLER (son of Louis C. STETTLER and Treacy BILDERBACK) was born on 14 Dec 1881 in Mercer County, Ohio. He was a laborer. Ora died of pernicious vomiting of pregnancy on 5 Nov 1925 at the age of 44 in Van Wert, Van Wert, Ohio. Ora was buried on 7 Nov 1925 at Woodland Union Cemetery in Van Wert, Van Wert, Ohio. She was a clerk. Richard was buried in Van Wert, Van Wert, Ohio. He was buried in Section 67, row 5 of the Woodland Union Cemetery. Her birth was not reported until June 14, 1876. She was married to William GEHRES on 12 Apr 1894 in Van Wert County, Ohio. They were married by Reverend R. Schlesinger. 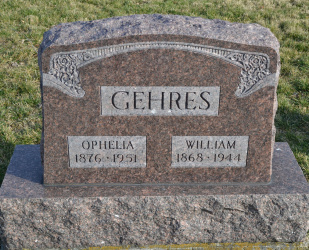 William GEHRES was born on 1 Feb 1868 in Harrison Twp, Van Wert, Ohio. 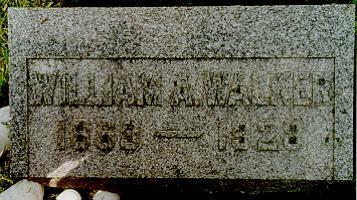 William died on 10 Jan 1944 in Harrison Twp, Van Wert, Ohio. He was buried on 13 Jan 1944 in row 18 of the Evangelical Protestant Cemetery in Convoy, Van Wert, Ohio. Ophelia died of cerebral hemorhage on 25 Jun 1951 at the age of 75 in Willshire, Van Wert, Ohio. She was buried in 1951 in Convoy, Van Wert, Ohio. She was buried in row 18 of the Evangelical Protestant Cemetery. Rosina was confirmed on 10 Apr 1892. She was confirmed in the German Evangelical Protestant Church. 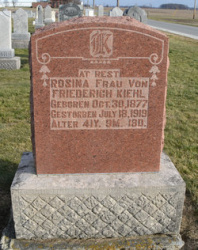 She was married to Walter Friedrich KIEHL on 19 Apr 1900 in Glenmore, Willshire, Ohio. 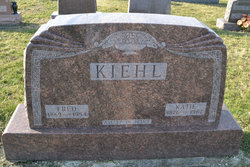 Walter Friedrich "Fred" KIEHL, son of Charles KIEHL and Anna Elizabeth KLINE, was born on 17 Jul 1869 in Harrison, Van Wert, Ohio. He was a farmer. Rosina died on 18 Jul 1919 in Harrison Twp, Van Wert, Ohio. 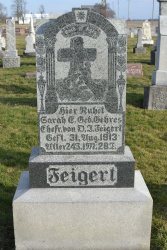 She was buried in 1919 in row 3 of the Evangelical Protestant Cemetery in Convoy, Van Wert, Ohio. Fred died in 1954 at the age of 85. 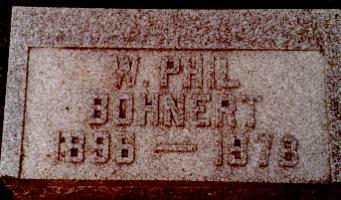 He was buried at Evangelical Protestant Cemetery in Convoy, Van Wert, Ohio. Fred was a farmer. Louisa was confirmed on 18 Mar 1894. She was confirmed in the German Evangelical Protestant Church. 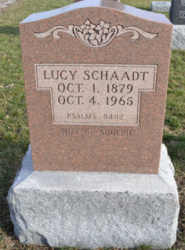 She was married to Adolph SCHAADT on 31 Aug 1905 in Van Wert, Van Wert, Ohio. They were married by Reverend F. Schlesinger. 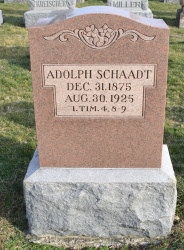 Adolph SCHAADT, son of John Adam SCHAADT and Susan FINKHOUSEN, was born on 31 Dec 1875 in Harrison Twp, Van Wert, Ohio. They appeared in the census in 1910 in Van Wert County, Ohio. 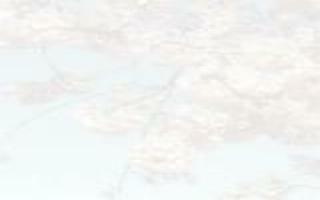 They appeared in the census in 1920 in Van Wert County, Ohio. Adolph died on 30 Aug 1925 at the age of 49 in Harrison, Van Wert, Ohio. He had been sick with liver trouble and had been bedfast for nine weeks before he passed away. He was buried on 2 Sep 1925 in row 3 of the Evangelical Protestant Cemetery in Convoy, Van Wert, Ohio. He was a farmer. Louisa died on 4 Oct 1965. She was buried in row 1 of the Evangelical Protestant Cemetery in Convoy, Van Wert, Ohio. 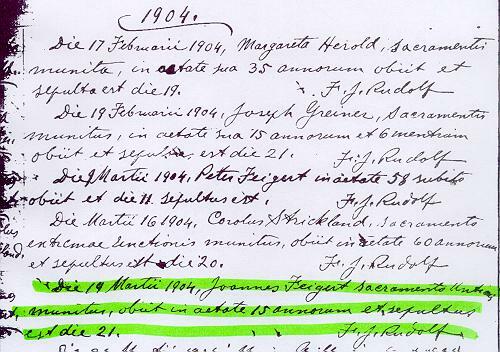 She was baptized on 8 Feb 1885. She was baptized in the German Evangelical Protestant Church. Her godparents are Joseph Feigert and Caroline Schaperjahn. She died on 14 Feb 1885. The church record her cause of death as pneumonia. 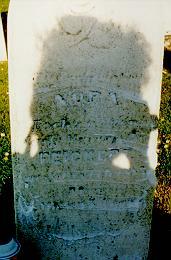 Nora was buried on 16 Feb 1885 in Convoy, Van Wert, Ohio. She was buried in 11th row, 15th stone from left of Evangelical Protestant Cemetery. She was married to David SCHAADT on 3 May 1906 in Van Wert, Van Wert, Ohio. They were married by Reverend F. Schlesinger. David SCHAADT, son of Jonathan A. SCHAADT and Sarah FINKHOUSEN, was born on 21 Apr 1881 in Harrison Twp, Van Wert, Ohio. David died on 9 Jun 1948 in Harrison Twp, Van Wert, Ohio. He died at home following a cerebral hemmorrhage. He had been ill for some time and suffered the fatal attack. He was buried on 11 Jun 1948 in Convoy, Van Wert, Ohio. He was buried in row 18 of the Evangelical Protestant Cemetery. He was a prominent Harrison Township farmer and was born on the same farm where he spent his entire lifetime. Emma died on 23 Aug 1976. She was buried on 25 Aug 1976 in Convoy, Van Wert, Ohio. She was buried in row 18 of the Evangelical Protestant Cemetery. Note: seven of these ten children died in their infancy. He was married to Sarah Elizabeth GEHRES on 29 Jan 1911 in Van Wert, Van Wert, Ohio. They were married by Reverend F. Schlesinger of German Evangelical Protestant Church. Sarah Elizabeth GEHRES, daughter of Phillip J. GEHRES and Elizabeth METZGER, was born on 3 Jul 1889 in Harrison Twp, Van Wert, Ohio. Sarah was baptized on 4 Aug 1889 in Harrison Twp, Van Wert, Ohio. She was baptized at German Evangelical Church. She was confirmed on 27 Mar 1904 in Harrison Twp, Van Wert, Ohio. She was confirmed at German Evangelical Church. Sarah died on 31 Aug 1913 in Harrison Twp, Van Wert, Ohio. Sarah was buried on 2 Sep 1913 in Convoy, Van Wert, Ohio. She was buried in 5th row, 27th stone from left of the Evangelical Protestant Cemetery. 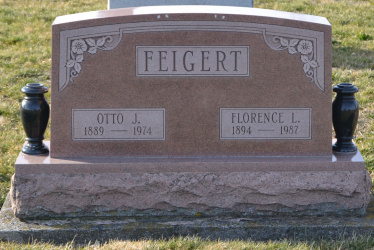 Otto was married to Florence Louisa KREISCHER on 11 Oct 1916 in Harrison, Van Wert, Ohio. He married a first cousin once removed. Florence Louisa KREISCHER, daughter of William Peter KREISCHER and Rosina GEHRES, was born on 22 Jan 1894 in Harrison Twp, Van Wert, Ohio. He was baptized on 19 Jul 1896. He was baptized in the German Evangelical Protestant Church. His godparents are Karolina Feikert and Wilhelm Gehres. He was confirmed on 9 Aug 1911. He was confirmed in the German Evangelical Protestant Church. He was married to Anna Elma THOMAS on 5 Dec 1918. Anna Elma THOMAS (daughter of Charles Wesley THOMAS and Lillie Belle AGLER) was born on 28 Aug 1896. Christopher B. Martin says her birth date is August 29, 1896. They appeared in the census in Jan 1920 at 611 Leeson Ave in Pleasant Twp, Van Wert, Ohio. Martin died in Sep 1966. He was buried in Van Wert. Van Wert, Ohio. He was buried in section 71, row 3 of the Woodland Union Cemetery. Anna died on 19 Oct 1981. She was buried	in Van Wert County, Ohio. She was buried in section 71, row 3 of the Woodlawn Cemetery.